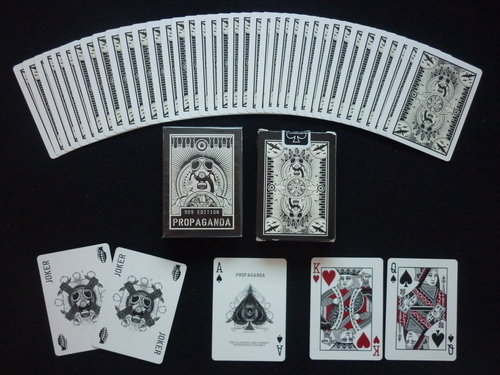 The Propaganda deck was Theory 11's first deck that was not produced under the Bicycle brand. They continued working with the design studio WA007, who previously had designed the Centurions. Printed on a "uniquely modified Tally Ho card stock". Comes with two custom jokers, a custom Ace of Spades, special colored court cards and a double backed gaff card.